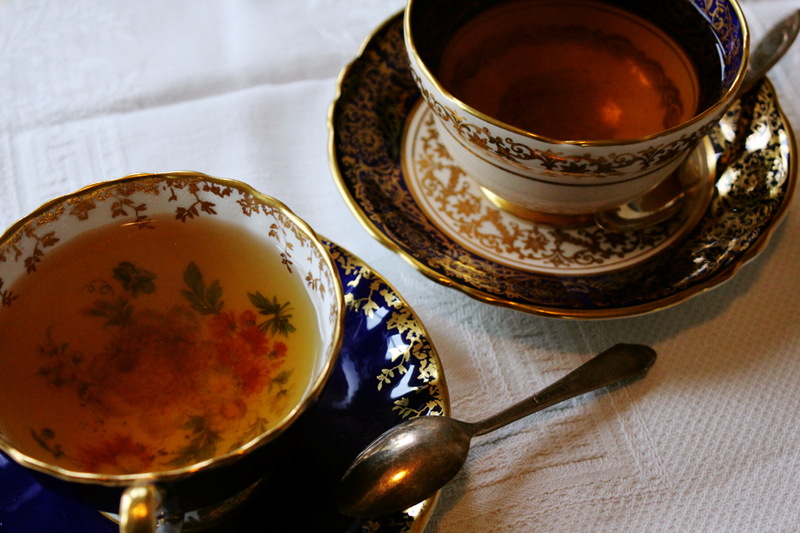 Last week I came across a fun blog hop whose theme is tea cup Tuesday. I stayed for a while and discovered some lovely new blogs, like Edith’s Sous Mon Arbre and Terri’s Artful Affirmations, both absolute sensual treats of pinkness, baby ducks and all things girlie. I love it. This morning Chloe had an early morning class at the university and then a three hour break. Perfect to come home for a nice cup of tea. Now I noticed that on these hops a lot of the ladies are identifying the tea cups. Out of my collection of lovelies I chose a blue cobalt and gold tea cup by Aynsley and a similar one by Paragon. I made us some Comforting tea by Aveda, (yes, the hair product people). It’s a fantastic mix of licorice root, peppermint and a touch of basil. I know it sounds a bit strange but the taste is out of this world. So here we are, my tea for two story, one happy and warm child, one serene mother and the rest of the day ahead full of wonderful possibilities. And don’t forget about my giveaway, still lots of time to leave me a hello. Herb salad for lunch straight from my garden. Your tea cups are beautiful, as is your daughter! Interesting combination of ingredients! Have a wonderful week! Hello Veronica, your post is so lovely! It has such a warm feel to it. How wonderful that you have these moments with your daughter. 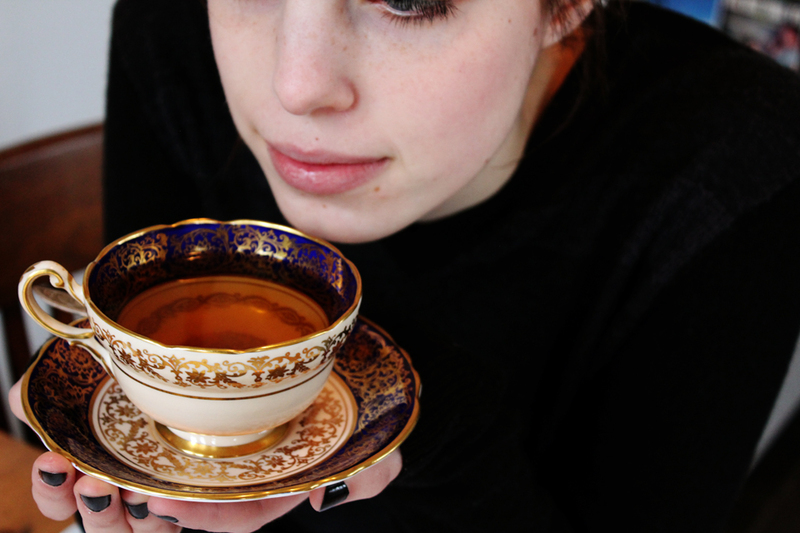 The tea cups are beautiful….Aynsley and Paragon two great companies. Both of them are fabulous to use I am sure. Thank you so much for linking up with our party this week! Yay! Hi Terri, thank you for coming to see me again. 🙂 I’m loving your Tuesdays and look forward this brilliant excuse to pull out my tea cups. Plus I love the girlie fun. Hi Mags, thank you so much. I was just thinking that, next week when my middle daughter brings her two little ones over, we’ll have a tea party! Bears, dolls…everything. 🙂 Those little sugar mice are made of fondant in little moulds which came from a store called Lakeland in the UK where I live for part of the year. I wonder if they would import to the US. They are a super big chain and so might send from their website to all over the world. Very beautiful tea cups you have there. Is the model your daughter? She is beautiful. Hi Felicity, I love your name. It means joy, doesn’t it? That is my daughter and my favorite model, all my children are my victims models. LOL. Thank you so much. You make me want to get out one of my teacups….I have a collection and a few of them look similar to yours! What a lovely way to enjoy your break! Oh…we have rain in northern Quebec…-40 last week and 7 today…Talk about extremes! Enjoy your tea and break out those teacups a bit more often…I think that I will too. Ooo! All of the things in the photos are like little gems! 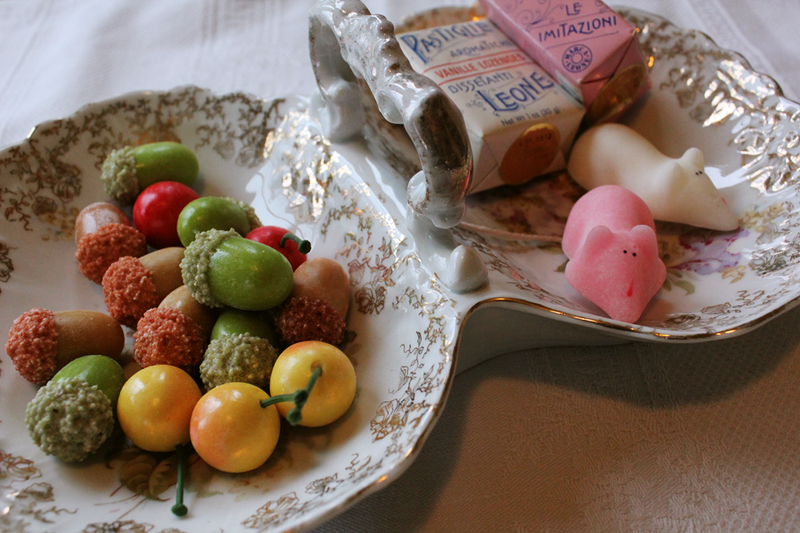 I love the marzipan and the lovely antique plates, cups and dishes. I don’t drink tea and it’s making me want a spot o’ tea!! Hi Rachel, thank you so much. I’m sure everything tastes better out of little gem cups. 🙂 Thank you for leaving your twitter link, now I can get to know you. Your tea cups are wonderful. I love them !